As TCT readers might have noticed, I don’t write much in the way of training reports during the season proper. Obviously, the training shifts to specific match preparation and the associated skills, drills and opposed work. It would be counterintuitive for an Eels supporter to report on how the team are planning to construct a victory each week. Secondly, there’s enough going on in and around matches across all the junior and senior grades of football. That becomes the primary focus for coverage by our site. Gowie at the media call. Nonetheless, I wanted to reinforce the comments made by David Gower and BA in interviews conducted this week. After watching their media, and reading mainstream examination of the team’s failure to fire, I felt it necessary to offer my observations. Both Gower and Arthur referenced the quality of the pre-season and the inability of the team to transfer training paddock form to match days. This is not any sort of losing team rhetoric. It’s fact. As a regular visitor to training, this is the most frustrating aspect of their performances this year. After watching weekly preparations, I sit in the stands during matches shaking my head. That WTF expletive gets a fair workout during those 80 minutes, and for some hours afterwards. Here’s why I am so nonplussed- and perhaps why many others are too. The team completed a pre-season that had players producing PBs. They were literally jumping out of their skin, ready to play, before the season kicked off. The Eels performance in the Newcastle trial was exactly what I expected to see. Come the season proper, this sequence of losses has supporters consistently question their fitness. It’s difficult to fault such opinions, because they are witnessing a fatigued team during matches. Playing without the footy will fatigue the fittest team, but fans are naturally concerned that the team don’t appear to be able to use the footy when they get it. More on that later. The attitude and enthusiasm at Saleyards has been first rate. The players challenge each other to be better – as they always have. Yet, the on-field version at times seems anything but that. When the team completed their major opposed session in the lead up to the clash with the Tigers, I left Old Saleyards filled with confidence. The positivity of their Captain’s Run only served to confirm my belief. By the second half of the match I was on social media. I normally wait for my emotions to clear before expressing an opinion, but here I was declaring that the Eels were playing exactly like a bottom placed team. I had allowed my frustration to explode. I want to emphasise again how different the preparations are to what is delivered on match day. In every aspect. They are fit. They prepare well. This has been the most agitating feature of the season. Nothing makes sense. The last 20 minutes of the Tigers match embodied what I regularly witness at training – a fit looking team throwing plenty of bodies in motion and a decent share of ball movement. If lack of fitness was a factor, the last 20 minutes would not have been the team’s best football – especially in a game which saw possession rates hover around 35% for long periods. I’ll make no major comment about this week, except to say that once again there was zero evidence of a club in crisis or players feuding with each other. The work was not just positive, it was fair busting with energy and attitude. But I can’t make any prediction of victories or improved performance. I have no magic answers. BA threw in a couple of bigger bodies last week in Terepo and Williams, and that may just be the start. Of course, a team can’t compete with around 40% of the football every week, and that scenario comes about through errors, penalties, giving up repeat sets or tries. Better execution and discipline will go some way towards remedying the situation, and as BA said, it has to be all 17 players bringing it. 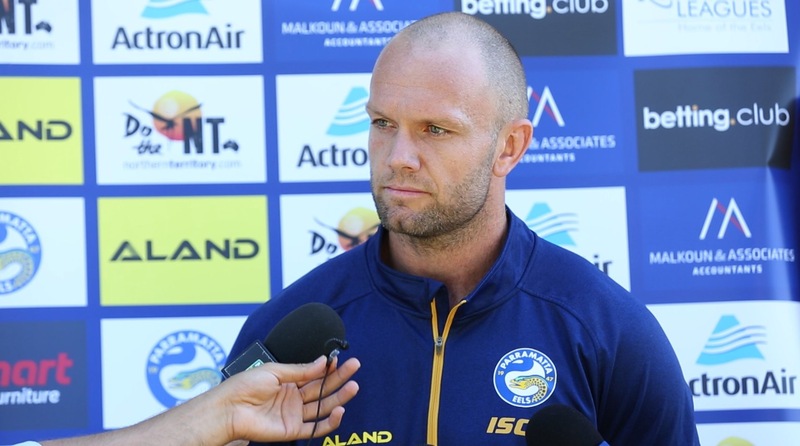 This has not been an easy opening to the season for any Eels fan. Every aspect of this season has turned what I thought I knew about footy on its head. The players are the only ones who know what they will deliver today. The only guarantee I can make is that the professionalism and effort in preparations from the staff and the players has not faltered. We simply need to see it at ANZ Stadium today. 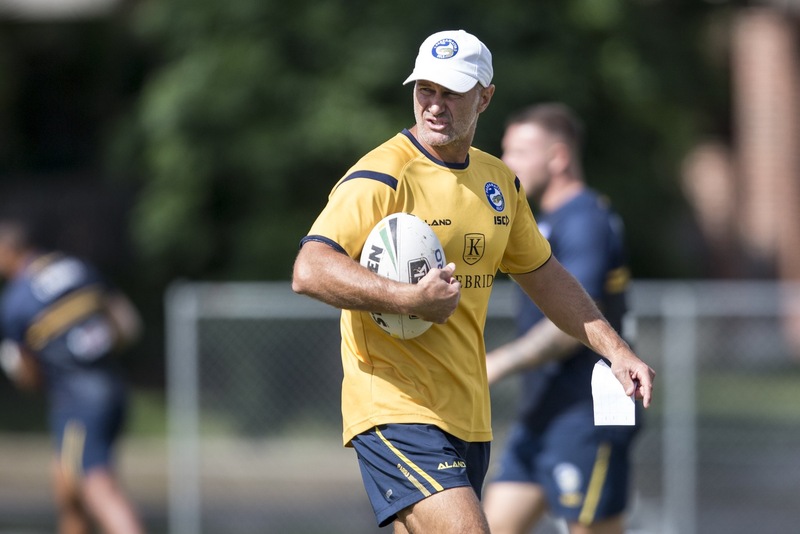 Fathead I think we need the warriors head trainer alex corvo his got the kiwi boys looking really game fit. If brad picks the same side next week if we lose today then burnie needs a good long chat with BA. Ask him what direction is he taking this club. I know ppl won’t cop 0/5 to start a season. If that is the case it will mean we have to win the next 15 games straight n I doubt that would happen. Lachlan Wilmot is a great trainer. Alex Corvo is a jet but he will be locked up long term. I don’t think it’s a fitness problem. I reckon it’s also that we have squeezed the money ball players dry by trying to save money and this has come back to bite us. Good write up 60’s and agree the colereation between training effort & match day performance are way out of whack. We are a better side than 0-5 but the results speak for themselves unfortunately. Now we fight to & nail for potentially a top 8 spot. Another loss or 2 and there is all’s sort of pressure on the whole organisation to save us from a horrendous start of the season that now goes back to some very dark days of the club !! I read a lot of reports in the pre-season about mechanics – body position in running, focus on ball handling etc. I guess we will see in 20 rounds time if this pays off but I am starting to doubt this avenue. To the casual observer, it doesn’t seem like these facets have actually improved markedly.